"No horse gets anywhere until he is harnessed. No stream or gas drives anything until it is confined. No river flow can be ever turned into light and power until it is tunneled. No life ever becomes great until it is focused, dedicated and disciplined." Self-discipline is like a muscle. The more you train it, the stronger it becomes. The less you train it, the weaker it becomes. Just as everyone has different muscular strength, we all possess different levels of self-discipline. Just as it takes muscle to build muscle, it takes self-discipline to build self-discipline. Saving money isn't all about whether or not you know how to score screaming bargains. It has more to do with your attitude towards money. As explained in the book The Millionaire Next Door by Thomas J. Stanley and William D. Danko, personal finance has as much to do with people's traits as with money. Many millionaires, in fact, have frugal ways. Understanding how personal traits can influence your finances is an essential ingredient for creating wealth. Self-discipline is one of the most important personal trait which acts as a leverage for building wealth. Also the importance of setting and working towards your goals is obvious. If you don't know where you are going, it's difficult to get there. It helps your personal finances immensely if you have money goals and are motivated to reach the goals that you have set for yourself. Those who lack goals don't have a roadmap to take them to the financial destination they want. When we talk about financial discipline, a systematic investment plan, SIP, is the most disciplined way of investing even in today's volatile stock market. You often decide to start saving and investing regularly, but get caught up in day-to-day activities and forget to make the investment. 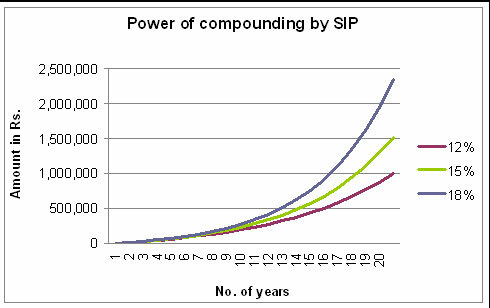 SIP is a time-tested discipline that makes it easy to invest automatically. This is also known as rupee-cost averaging and can help put the power of compounding on your side. In the above comparison, we considered three different growth rates for a fixed time horizon after taking into account the average returns that stock market investments have historically provided to investors. Let us now consider a more comprehensive scenario where we have different time horizon and different growth rates. * Rs 1,000 per month invested. Thus it is clear from the above table that in case of financial discipline, a Systematic Investment Plan (SIP) is the most effective way of adding more value to your wealth in India. 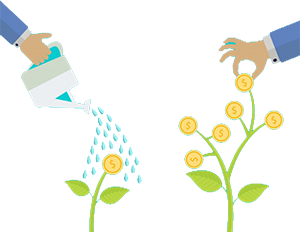 Nominal investment of Rs 1,000 per month can generate enormous wealth over a period of time. This shows that you need the discipline to continue to save money for specific, long-term goals every month.